In 1997 Cantor Ilan Mamber of Temple Beth Rishon in Wyckoff, NJ, a motorcyclist for many years, organized a rather unique group of bikers. At the time, this had been the only known Jewish motorcycle club in the country. They were only a hand full of riders initially, riding under the name, 'Galgalei Shalom', the Wheels of Peace. It was a great name but the Hebrew was not easily remembered and in a moment of great inspiration in 1998, Cantor Ilan re-named the club the Hillel's Angels. 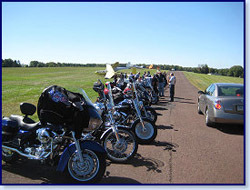 Soon, many more motorcyclists from across the state of New Jersey had heard of this band of Jewish riders and could not resist the allure of riding with the new Angels. But the life of a Cantor, at least a Cantor as productive as Cantor Ilan, does not allow for all that much time for riding! While the concept was great, it was a struggle to get rides scheduled and Ilan and the club needed someone to help share the load of leading and organizing rides. 1999: enter a new Temple member and motorcyclist, Mel Morris. Mel was instrumental in creating the first club logo and building a real ride schedule that we maintain to this day. The last Sunday of every month, from March through October is a Hillel's Angels ride day! Now, with the advent of our forum, we have more rides than ever before. Mel's passion for the club, the name, the new logo, and growing participation worked together to draw the attention of the Jewish press and a number of articles appeared through out New Jersey. This lead to even more participants. Through all of this time, Hillel's Angels was a club in name only, i.e., it was not structured. There was no charter or mission statement, no meetings, no dues, and no officers other than its de facto ride leaders: Cantor Mamber, Mel Morris, and then, Steve Kaplowitz. This created a few issues that gave the above mentioned ride leaders and club founders reason for concern. First, with Mel having moved to Florida, he was no longer available to lead rides. Steve had noted a desire to dramatically cut down on the number of rides he did lead and the Cantors schedule was no more forgiving than it had been in the past. In March of 2007, the club took on a more organized structure with the election of Gil Paul as the first formal President of the Hillel’s Angels. That board formalized a charter which serves as a foundation of rules that we use today. In March of 2009, this board was unanimously re-elected for an additional two year term. Gil was succeeded as president by David Levine, Gil's vice president. David served the club well during his term in office. Mike Reuveni assumed the presidency for two years. Ari Wallach became the next president for two years, then Jeff Sprintz assumed the office. Alan Kane became president in 2016 and like those before, continues the tradition of selfless service to the club that we are so proud of. And so our club continues to grow. We keep on rolling, we keep on riding. We keep on making new friends. The above shot was taken at Van Sant Air Strip near New Hope, PA.